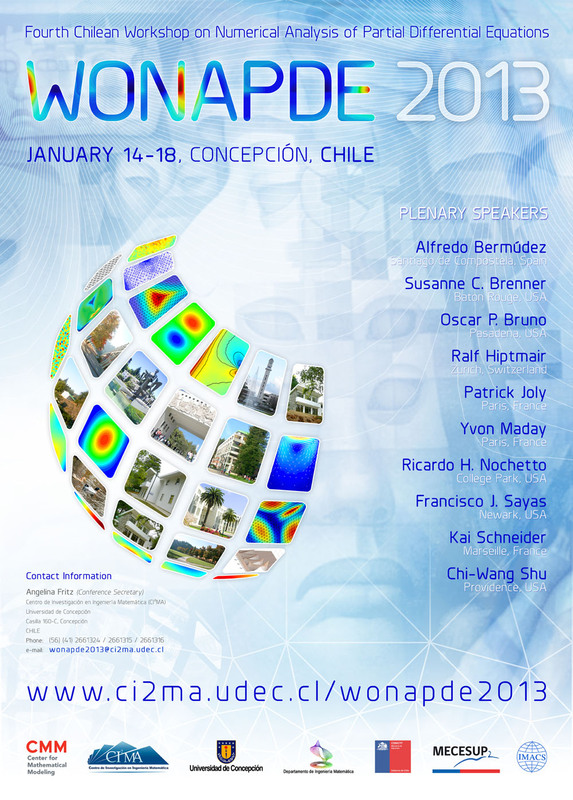 The Center for Research in Mathematical Engineering (CI²MA) and the Department of Mathematical Engineering of the Universidad de Concepción, Concepción, Chile, are proud to host the Fourth Chilean Workshop on Numerical Analysis of Partial Differential Equations (WONAPDE 2013), to be held on January 14-18, 2013. Note that the official language of this event is ENGLISH. The week before WONAPDE 2013, the Symposium of the International Association for Boundary Element Methods, IABEM 2013, will take place in Santiago. This is a good opportunity to attend both events. The conference program will include: 50-minutes plenary lectures and 25-minutes presentations in minisymposia or in sessions of communications. In order to make a presentation, authors are invited to submit a one-page abstract, before September 30th, to: wonapde2013@ci2ma.udec.cl. Alternatively, authors may contact directly the organizers of minisymposia. Here you can download the LaTeX file sample or the PDF file sample. Those interested in organizing a new minisimposium are invited to submit a proposal, including title and a tentative list of at least four speakers, before July 31th, to: wonapde2013@ci2ma.udec.cl. The Scientific Committee will evaluate each proposal and communicate its decision in due course. A special issue of the journal APPLIED NUMERICAL MATHEMATICS containing selected works presented at WONAPDE 2013 will be edited short after the conference.